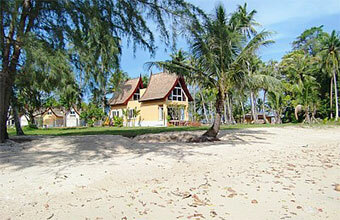 Koh Chang, Modern Thai Beach Front Villa for Sale. A well maintained 4 Bedroom modern Thai villa set in 388sqm of immaculate surroundings and located on the beautiful Chang Noi Beach in Klong Son, Koh Chang. The villa has an internal size of 130 sqm, has 4 en-suite bedrooms, is air conditioned and furnished to a very high standard. The property has a large open living room which faces the sea and a well equipped European kitchen with all appliances and utensils. The outside terrace is fantastic for al fresco dining under the stars. The garden is landscaped to a high standard and extends right to the sea at high tide. This is real beach front! Although Siam Royal View is still under construction guests can enjoy the use of the fantastic 50 metre swimming pool, on-site restaurant and will have over 1km of private beach to relax on. This 4 bedroom villa is very well appointed and complete, from cutlery to ceramics, towels and bed sheets. The development is located 5 minutes drive from the ferry pier and under 5 minutes from the village of Klong Son village. The villa is brand-new and so is all of its furniture and oriental decor plus commodities. Everything functions properly; drains, hot water(GOOD pressure! ), window and door fittings etc..